What a stunning card. Your used some wonderful techniques which I enjoyed reading. The colours are so vibrant. This is beautiful, such a pretty image and lots of fabulous details. Gorgeous card, love the super cute image and very pretty details. Oh wow, this looks gorgeous! So much detail, much job behind every little element. I wouldn't even know where to begin putting such a heavily decorated card together. Love it! 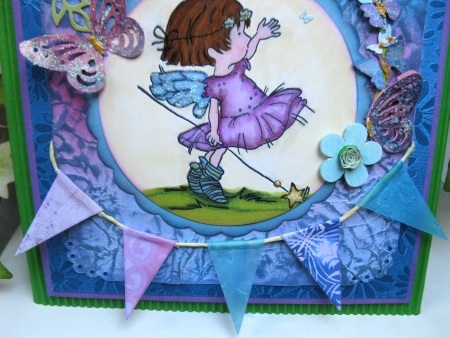 Alice, so pretty with this sweet little blue fairy (you & I must be on a 'blue kick' of late! It's one of my fav colors too). 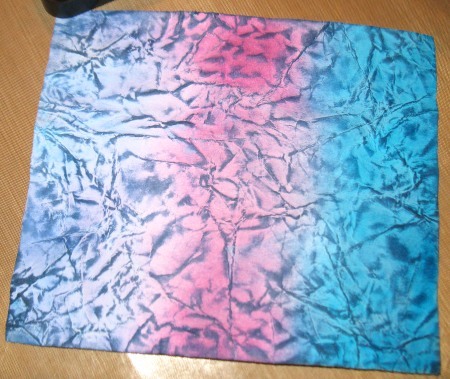 TFS the way you created the 'batik background', as it's so pretty, and I will be trying that! 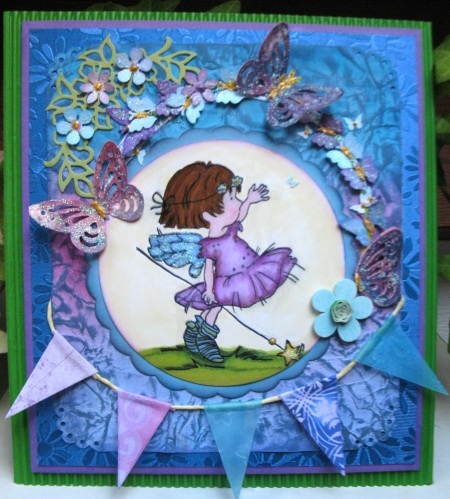 Loved all the 'bits & bobs' that you've added on this very feminine & beautiful fairy card, with all the layers & interesting embellishments. It's lovely. TFS & Hugs. Happy week ahead. 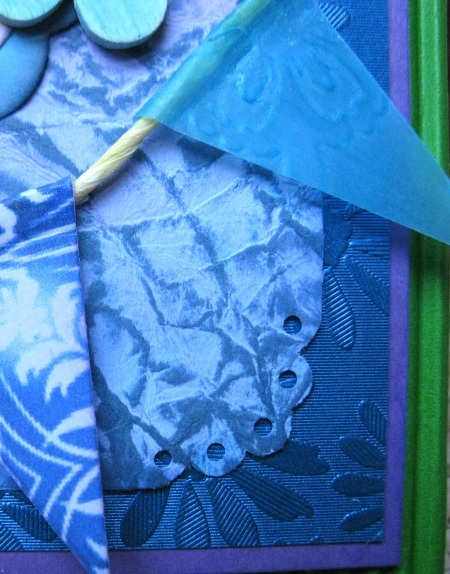 This is so pretty - I love the bold bright colours you have used- some very pretty layers. Thanks for playing at Let's Craft and Create. Congratulations! Now I would like to talk about your card! Wow, this is beautiful! I really like this colour combo and I was particularly impressed with how you made the background! 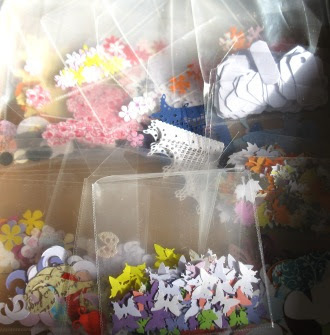 I love the banner you made and also the ring of butterflies as well as the gorgeous flowers! The little fairy is so cute with her sparkly wings! So many details to look at and enjoy! I laughed when I saw Archie with the calendar! That is so funny! Bei colori Alice, tale immagine dolce e lo scintillio è perfetto con la fata dolce. Molte grazie per unirsi a Allsorts sfida. mi piace molto il colore dominante che hai usato (l'azzurro) e come hai colorato il timbro. Bravissima come sempre a recuperare gli scarti! La tecnica batik la conoscevo. Prima o poi mi deciderò a usarla anch'io. Wow Alice - what a stunning card. Fascinating to read all the work that went into making it - such a gorgeous result! And I don't blame elf for staying with with you - sensible fellow! Your color scheme is gorgeous and I love the framing you created around your image! Gosh Alice where do I start. Your card has been so lovingly made. It must have taken you ages to complete but it is a masterpiece. I adore the colours and all the butterflies and your inking is perfect on the background piece. Altogether a masterpiece. 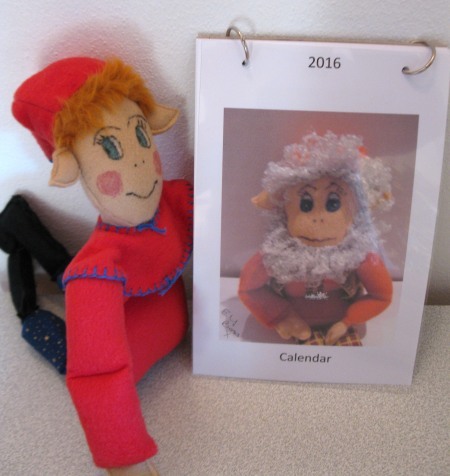 Thankyou for showing the picture of Arci with Pesky Elf on his Calendar. Thankyouy also for fluttering by my inky challenge. hugs Mrs A.
Oh wow!!! This card is fabulous, Alice. The colours are so bright and vibrant .... and there's plenty of shimmer and shine which i absolutely LOVE!!! Great job, my friend! Alice è meravigliosa! Bella la Storia del recupero degli avanzi e dell'Elfo affezionato! Ci credo che preferisce la riviera! 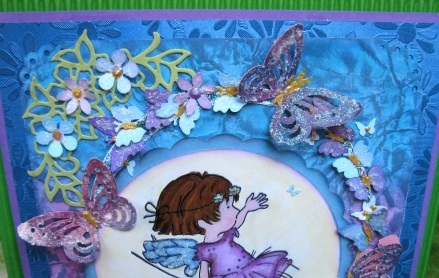 Very beautiful card.Love the colours and the very pretty image.Lovely butterflies. All the little details on this are absolutely beautiful! You really put so much effort and love into this design! E' semplicemente adorabile! Il banner, lo sfondo stropicciato e tutti i piccoli dettagli, wow! 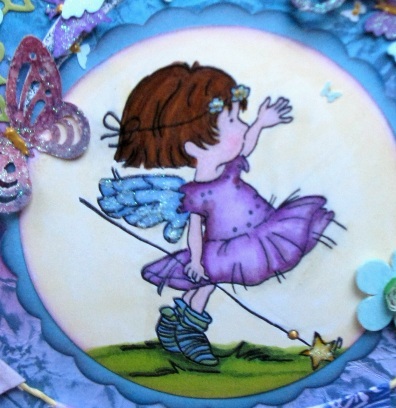 Such a pretty card - just perfect for our 'Things with Wings' challenge this week. I love all the detail you're added. Thank you for sharing it with us and joining in with the fun at Sweet Stampin’ this week and good luck. Super bella! Colori e sfumature incredibili!!! 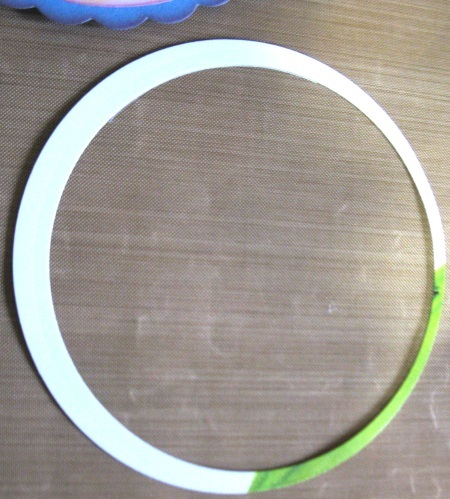 Bravissima! This is such a gorgeous card! Love the image and the vivid blues you chose. 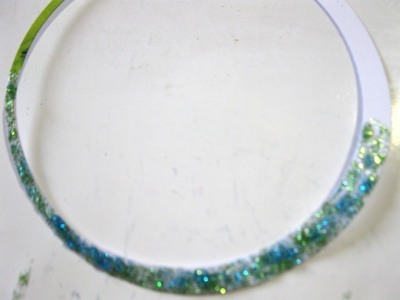 Thanks for the idea of the glittered circlet to hold the butterflies!